“Not having electricity meant no heat and no hot water,” said Fagan, who’s lived in her home for 17 years. “I just hope that rates don’t go up. The utility so expensive as it is,” she said. Yet United Illuminating says it needs to raise rates to make up for what it lost during Sandy, Tropical Storm Irene and the Nor’Easter of 2011. 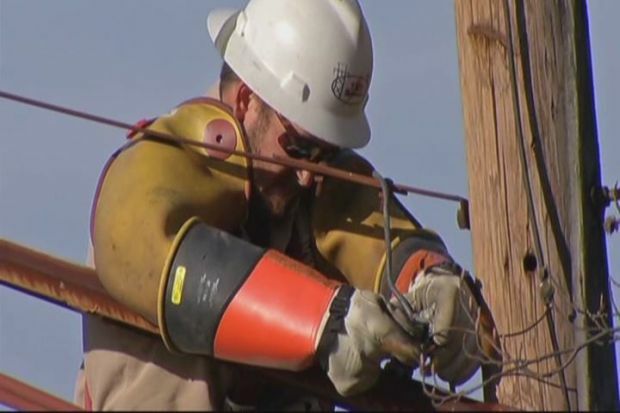 The power company filed a letter of intent with the Connecticut Public Utilities Regulatory Authority (PURA) to apply for a rate increase. James P. Torgerson, president and chief executive officer of UI and its parent company, says it’s necessary to recover costs incurred during all three disasters. Attorney General George Jepsen says his office will carefully look over the rate increase. Though he understands the need to upgrade infrastructure, he wants to “approve rates that are no more than just and reasonable as required by the law." United Illuminating announced they filed with the state so that electricity rates can be raised to help recoup the cost from Sandy, Irene and the October 2011 snowstorm. “Raising the rates, it might be a long term solution but it’s pretty frustrating to those people who are still trying to recover from Sandy and get their lives back together,” said Kate Gedney. She also lives across from the beach in Milford. She had no power for nearly two weeks after the storm and says many of her neighbors are still not back in their homes. “It’s pretty frustrating. Electric is pretty high as it is already and to be inconvenienced for two weeks,” Gedney said. At this point U-I says it doesn’t know by how much a single bill could go up. If it’s approved new rates will not take effect until January of next year.